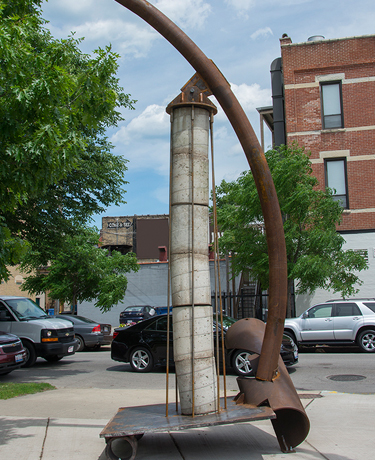 Mike Baur feels that “weight, stability and permanence” are important to him and for that reason they are integral elements of his sculpture work. This concern could date back to Baur’s days at the University of Illinois Urbana-Champaign where his first year M.F.A. works, all fiberglass, were destroyed by a tornado. Whatever the reason, these days Baur’s works principally include concrete and steel. 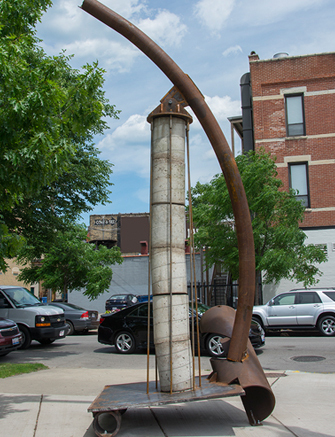 “Bronze Bollards” is one of Baur’s steel and concrete works. Typically associated with mooring ships and keeping out auto traffic, bollards are the definition of permanent. 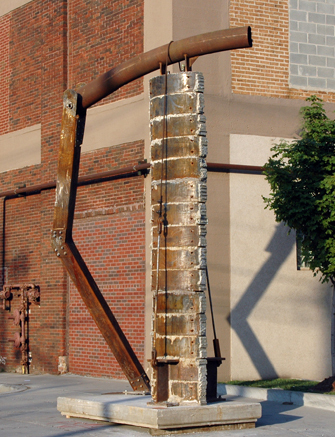 The work incorporates recycled material and the steel and concrete components appear aged by the weather. The old appearance only enhances “Bronze Bollards” sense of durability. In our disposable, digital, update and refresh society, staying still can be a bold artistic stance.